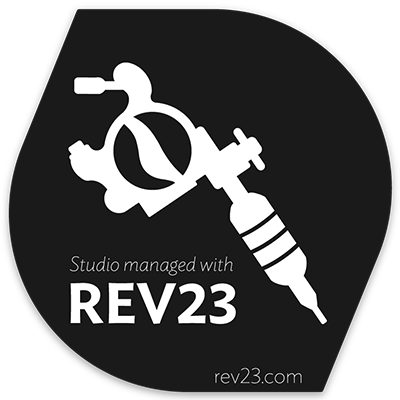 Let everyone know your shop is managed with REV23 tattoo studio software with this vinyl static cling! Attaches without adhesive to glass surfaces (not suitable for outdoors). Snap a pic and tag us with @rev23dev and #rev23. One (1) vinyl static cling. One (1) REV23 die cut vinyl static cling. There are no reviews for this product yet. Be the first to write one. REV23 does not offer refunds on this item. Damaged or defective hardware can be returned within 10 days for an exact replacement. Issues with hardware outside of this window are subject to the manufacturer's warranty.